There’s another budding author in the family. Not only have I published a few (non-fiction) books on Kindle and CreateSpace (Amazon’s print-on-demand service), my beautiful wife has her comedy fairy tale and now my brother Richard is bidding for glory too – in the comedy fantasy genre, with his first book titled Relioc Tower. Now this is quite exciting as Richard has not gone down the traditional publishing route but is competing against other authors on the KindleScout site. This is where Amazon select a book and publish it on behalf of the author so they get the benefit of a big publisher behind them – rather like a traditional offline publisher. However, rather than some faceless editor deciding on a whim whether a new author fails before he even starts, Amazon ask for opinions from enthusiastic readers. We’d like you to follow this link to KindleScout and nominate this book – you can nominate up to 3 books at a time and once the publish / no-publish deadline is up, your nomination is free to be used again. There’s a few snippets from the book for you to read and an ‘about me’ of Richard too. If the book is chosen, nominators will be rewarded with a copy of the book, so it’s a win-win all round. 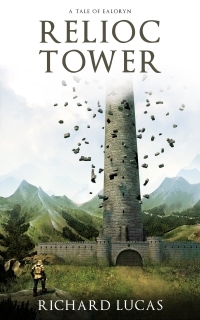 So please – go on over to Kindle Scout and nominate Relioc Tower by Richard Lucas. It has to be done by the end of November 2016. I will thank you, my wife Beth will thank you and no doubt Richard will heap his blessings on you too. There’s an element of quid pro quo too of course. Let me know you’ve added your nomination and when you want your next book nominated, we’ll be there for you too.